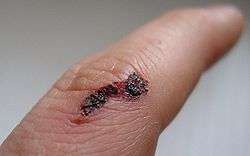 Exudate from a wound on a human finger. An exudate is a fluid emitted by an organism through pores or a wound, a process known as exuding. Exudate is derived from exude, "to ooze," from the Latin exsūdāre, "to (ooze) out like sweat" (ex- "out" and sūdāre "to sweat"). An exudate is any fluid that filters from the circulatory system into lesions or areas of inflammation. It can be a pus-like or clear fluid. When an injury occurs, leaving skin exposed, it leaks out of the blood vessels and into nearby tissues. The fluid is composed of serum, fibrin, and white blood cells. Exudate may ooze from cuts or from areas of infection or inflammation. Purulent or suppurative exudate consists of plasma with both active and dead neutrophils, fibrinogen, and necrotic parenchymal cells. This kind of exudate is consistent with more severe infections, and is commonly referred to as pus. Fibrinous exudate is composed mainly of fibrinogen and fibrin. It is characteristic of rheumatic carditis, but is seen in all severe injuries such as strep throat and bacterial pneumonia. Fibrinous inflammation is often difficult to resolve due to blood vessels growing into the exudate and filling space that was occupied by fibrin. Often, large amounts of antibiotics are necessary for resolution. Catarrhal exudate is seen in the nose and throat and is characterized by a high content of mucus. Malignant (or cancerous) pleural effusion is effusion where cancer cells are present. It is usually classified as exudate. There is an important distinction between transudates and exudates. Transudates are caused by disturbances of hydrostatic or colloid osmotic pressure, not by inflammation. They have a low protein content in comparison to exudates. Medical distinction between transudates and exudates is through the measurement of the specific gravity of extracted fluid. Specific gravity is used to measure the protein content of the fluid. The higher the specific gravity, the greater the likelihood of capillary permeability changes in relation to body cavities. For example, the specific gravity of the transudate is usually less than 1.012 and a protein content of less than 2 g/100 mL (2 g%). Rivalta test may be used to differentiate an exudate from a transudate. It is not clear if there is a distinction in the difference of transudates and exudates in plants. Plant exudates include saps, gums, latex, resin. Sometimes nectar is considered an exudate. Plant roots exude a variety of molecules into the rhizosphere, including acids, sugars, polysaccharides and ectoenzymes; this can account for 40% of root carbon. Exudation of these compounds has various benefits to the plant and to the microorganisms of the rhizosphere. ↑ "exudate". The Free Dictionary - Medical. Retrieved 5 August 2014. ↑ ""Exuded" Merriam-Webster Online Dictionary". Meriam Webster. 2008. Retrieved 2008-07-04. ↑ Robert K. Barnhart, ed. (1988). Chambers Dictionary of Etymology. New York: Chambers Harrap Publishers. p. 363. ISBN 0-550-14230-4. 1 2 The University of Utah • Spencer S. Eccles Health Sciences Library > WebPath images > "Inflammation". 1 2 3 Heffner J, Brown L, Barbieri C (1997). "Diagnostic value of tests that discriminate between exudative and transudative pleural effusions. Primary Study Investigators". Chest. 111 (4): 970–80. doi:10.1378/chest.111.4.970. PMID 9106577. 1 2 Light R, Macgregor M, Luchsinger P, Ball W (1972). "Pleural effusions: the diagnostic separation of transudates and exudates". Ann Intern Med. 77 (4): 507–13. doi:10.7326/0003-4819-77-4-507. PMID 4642731. ↑ Roth BJ, O'Meara TF, Gragun WH (1990). "The serum-effusion albumin gradient in the evaluation of pleural effusions". Chest. 98 (3): 546–9. doi:10.1378/chest.98.3.546. PMID 2152757. ↑ Power, Michael L. (2010). Anne M. Burrows; Leanne T. Nash, eds. The Evolution of Exudativory in Primates / Nutritional and Digestive Challenges to Being a Gum-feeding Primate. Springer. p. 28. Retrieved 2 October 2012. ↑ Marschner, Horst (1995). Mineral Nutrition of Higher Plants. ISBN 0124735436. ↑ Walker, T. S.; Bais, H. P.; Grotewold, E.; Vivanco, J. M. (2003). "Root Exudation and Rhizosphere Biology". Plant Physiology. 132 (1): 44–51. doi:10.1104/pp.102.019661. PMC 1540314 . PMID 12746510.